Discussion in 'POTW Collaboration' started by Serebii, Jun 24, 2018. Exeggutor, my how have the mighty have fallen. One of the best Grass types in Gen I, it has fallen by the wayside over the years as various new threats have shown up to wreak havoc. Grass Psychic is one of the worst typings in the game, packing 6 weaknesses and a double weakness to Bug. However, its Alolan Form packs a new Dragon typing along with a slightly buffed Attack in return for a poorer speed (which isn't saying much as Kantonian Exeggutor is pretty slow to begin with)... along with almost as many weaknesses including a double weakness to Ice. 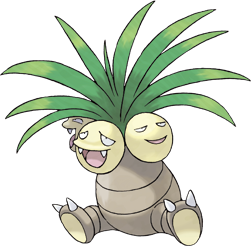 It should be noted however, that both Exeggutor's thrive in the Sun and Trick Room and offer consideration to be used on such teams. Sunny Day Sweeper set. This set is entirely reliant on the sun being up to function, whether through Exeggutor's own doing or a teammates. Solarbeam is fantastic inside the Sun, being an amazing STAB that will chew through most of the opposition with ease. Sleep Powder is another must, disabling any potential checks on the switch in, and enabling Exeggutor to setup or get away. Psyshock is great, being STAB and bypassing Special Walls that would otherwise stop Exeggutor cold. Last move is up to preference. Energy Ball, Grass Knot and Giga Drain are all alternative options to Solarbeam (when out of the sun) each with different benefits (Consistent Power vs Peak Power vs Recovery), while Sunny Day enables Exeggutor to get the Sun a Shining again itself. Item is up to preference. Life Orb offers a consistent power buff, while Solarbeam Powered Bloom Doom is a great one time nuke. Heat Rock and Firnium Z should only be used with Sunny Day. Heat Rock extends Sunny Days time, while Firnium Z provides a speed boost to help ensure Exeggutor outspeeds the opposition (Firnium Z sets can aim for more Bulk in the EVs since the Z-Sunny Day means not as much investment is required). This set is meant to abuse the recovery that Harvest can give. Have a Sitrus Berry that comes back 50% of the time (or will come back in the sun) is fantastic and can make Alolan Exeggutor much more difficult to take out thanks to its above average defenses. Giga Drain is for damage and extra recovery, Toxic is for reliable damage while stalling. Last moves are up to you. Protect + Substitute is great for Toxic stalling and synergizes well with Harvest (watch out for Bug Buzz and Clanging Scales!) Dual Screens increases Exeggutors bulk (if you are only running one screen, tweak your EVs to cover the defense not covered by your screen), while Sunny Day = Guaranteed berry retrieval. Dragon Hammer is an option for opponents with Liquid Ooze who otherwise wall this set hard, as well as Poison types in general. -Flamethrower -Alolan Exeggutor gets it. Fire Breathing Palm Trees baby! If used right, this can be a very merciless set, especially in Singles. This is meant to use its signature move cause why not. It's meant to use on Tailwind teams and Trick Room is an Anti-Meta move against Fast Sweeping Teams by Opponents who think they have the upper hand against you when Tailwind is over. This can work in both Single and Doubles. Also is it just me or do they have that derp/troll face on there heads? This is meant to use its signature move cause why not. It's meant to use on Sunny Day teams and Trick Room is an Anti-Meta move against fast Rain Dance teams or Fast Sweeping Teams by Opponents who think they have the upper hand against you when Sunny Day is over. This can work in both Single and Doubles. Alolan Exeggutor can't have Chlorophyll. Its only abilities are Frisk and Harvest. I changed it. Luckily for me 7th gen is comprised of a lot of Pokemon for Tailwind/Trickroom combo teams. 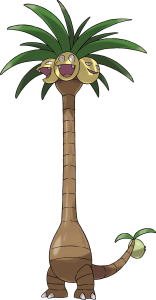 Other than that, there's not really much to go on for Alolan Exeggutor's playstyle. Might change it later if something comes by.